I started reading P.D. James fairly recently, when a colleague de-cluttered her house and gave me a box full of books, including several by this author. I knew the name, but had failed up to that point to read anything relevant (plus, for some reason I always mistook her for A.S. Byatt, but that's another story altogether..). So, following the announcement of her death, I thought it proper to write down my thoughts on the first experience I had with P.D. James: Cover her face, the first of the Adam Dalgliesh Mysteries. I have to admit: this type of novel always intrigues me. Like so many TV series inspired by similar books, I'm always game for a (slightly rural) setting somewhere picturesque in the UK, with a (relatively) well-off family with secrets, some back-stabbing among the staff and family, and of course a detective who is definitely wholesome, perhaps slightly attractive, perhaps slightly older in age, good-natured and always ready to offer justice. In this respect, the book does not disappoint: we are introduced to the household of Martingale, where owner Mrs. Eleanor Maxie is hosting a dinner party. Going through the various guests, one person is quickly put on the spotlight: Sally Jupp, one of the domestics, a single mother with a baby. She is not appreciated by everyone, and already from the first pages it's evident that she will cause trouble. I really enjoy the writing of the book, where I can read about the thoughts of each of the characters, so that I get a glimpse into the background of all the activities. There is tension when, the following day, Eleanor's daughter Deborah visits her brother Stephen and sees him with Sally. Things escalate further on, when both appear in a celebration wearing the same clothes and accessories. When Sally announces that Stephen has asked her to marry him, the outrage is visible: she is cast as a social ladder climber, is met with abusive words and is shunned. This is what is happening: the day following the celebrations, Sally appears to have overslept. But, of course, she's dead. In charge with finding her murderer, we are now introduced to Adam Dalgliesh, a gentleman detective. Writing poetry, having an appearance that may well allure to Mr. Darcy of Austen's Pride and Prejudice, he has all the right attributes to keep my interest intact - and I would have liked to have met him a lot earlier in the book. 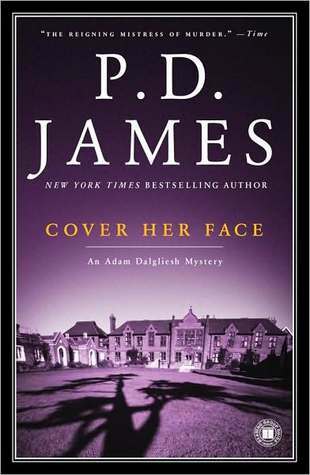 Cover her face manages to steer clear of giving away any clues as to whodunnit, and my imagination runs wild until the end. I'm not sure whether that is a good thing, given that I found the revelation of the murderer a bit of a let-down. Still, I found it a well-written first-time crime novel, and it has whetted my appetite for more of Dalgliesh and definitely more of P.D. James.